To deal with extreme field conditions, researchers have developed a self-contained diagnostics laboratory in a suitcase. Designed to perform Ebola testing, the diagnostic platform uses solar power and room temperature reactions to provide results in as little as 15 minutes. In response to the ongoing West African Ebola outbreak, research and development of diagnostics has reached a fever pitch. Several tests have received emergency use authorization from the FDA, but they use relatively slow methods, like RT-PCR, which can take several hours to run and must be performed in full-service laboratories. Testing more quickly and at the point of care is a highly desirable outcome. Alternatively, testing in the field could help with patient treatment on-site and prevent the spread of the disease caused by travel or transport of the specimens. Recently, a team at the Deutsches Primatenzentrum (DPZ) developed a potential solution that provides rapid testing even in the most extreme conditions, according to a recent press release. 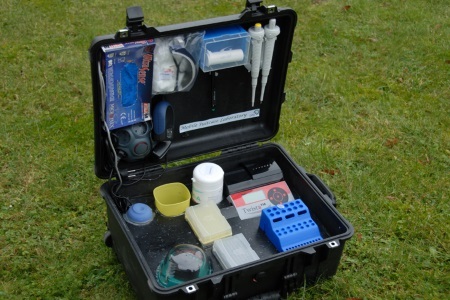 The new “Diagnostics-in-a-Suitcase” contains all the reagents and equipment necessary to detect Ebola within 15 minutes using energy supplied by a solar panel with a power pack. The new design promises to eliminate the transport of infected materials and specimens. Unlike some of the other laboratory-based tests, the Diagnostics-in-a-Suitcase technology is based on polymerase chain amplification, according to the press release. Originally developed by TwistDx Ltd., a subsidiary of Alere Inc., it was adapted for the diagnosis of Ebola. This method is as sensitive as RT-PCR, but requires no extreme temperature conditions and can be run at a constant temperature. Additionally, the reagents used to perform the chemical reactions in the test do not require refrigeration and can be transported without special preservation. The Diagnostics-in-a-Suitcase project was one of six concepts chosen for further funding in a competition from the British Enhancing Learning and Research for Humanitarian Assistance (ELRHA) hosted by the Save the Children Fund as part of the Research for Health in Humanitarian Crisis (R2HC) program. It is scheduled to begin field trials in Guinea shortly, according to the press release. Dr. Ahmed Abd El Wahed is the innovator who developed the Diagnostics-in-a-Suitcase model and will be assembling five of them for use in the trial. Several other rapid Ebola diagnostic tests are being developed for point-of-care applications. One of these, being developed in France, is used in a way that is analogous to a home pregnancy test, providing results in as little as 15 minutes. Another from MIT is based on paper test strip technology.